I love to bake using bananas as my main flavor ingredients...breads, pies, muffins, cakes, you name it...I like to bake it! 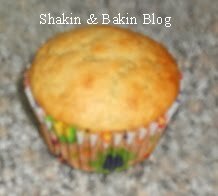 This is a nice and moist banana muffin recipe that is easy to prepare and only takes a few basic ingredients. You can omit or include the chocolate chips. Optional: If desired you can add in a 1/4 cup of milk chocolate chips. In a large Tupperware mixing bowl, combine the all-purpose flour, granulated sugar, baking powder and table salt. In a medium sized Tupperware mixing bowl, combine together the slightly beaten egg, cold milk and vegetable oil. Stir these ingredients into the flour mixture until combined. Batter will be lumpy. Finally, stir in the 1 cup of mashed bananas and chocolate chips if desired. Line your muffin pan with paper liners. Fill the cups 3/4 of the way full with batter. Place pan in a preheated 350 degree oven for 15 to 20 minutes. Remove from oven when they are done and the centers bounce back. Not a good muffin maker..don't know why, but I can put this into a loaf pan. I can't remember the last time I made banana chip anything.